Boeing announced today that final assembly of the 787-10, the newest and longest member of the 787 Dreamliner family of airplanes, will take place exclusively in North Charleston, S.C.
Boeing will continue to assemble both 787-8s and 787-9s in Everett, Wash., and North Charleston. Design of the 787-10 is underway in Everett, with final assembly of the first 787-10 scheduled to begin in South Carolina in 2017. The 787-10 will be 18 feet (5.5 meters) longer than the 787-9. With 10 feet (3 meters) of that increase in the midbody section, the 787-10 midbody is too long to be transported efficiently from North Charleston, where systems integration work is performed, to the Everett facility for final assembly. In addition, introducing the 787-10 in North Charleston takes advantage of that facility’s capacity while allowing the Everett facility to continue improving productivity as it focuses on the 787-8 and 787-9. The 787 production system includes three production lines: two in Everett (including a temporary surge line) and one in South Carolina. The integrated production system currently operates at a production rate of 10 airplanes per month. As announced last year, the 787 production rate will increase to 12 airplanes per month in 2016 and 14 per month by the end of the decade. 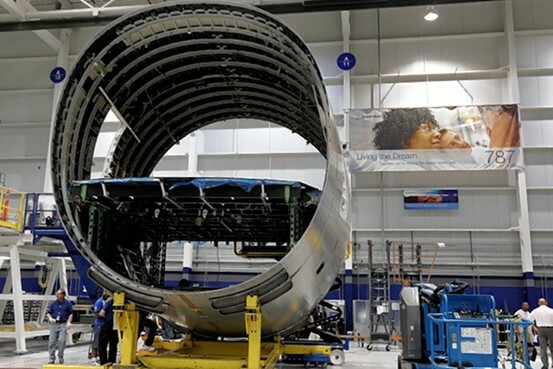 The Everett facility will continue to assemble seven airplanes per month, while Boeing South Carolina final assembly will gradually increase from three 787s per month today to five per month in 2016 and seven per month by the end of the decade. The Boeing 787 Dreamliner family of airplanes offers airlines unmatched fuel efficiencies and environmental performance, while providing a new level of comfort for passengers through the thoughtful application of new technologies. To date, the 787 family has won more than 1,000 orders and more than 165 airplanes have been delivered to 21 customers worldwide. The 787-10 will leverage 787 technology to provide more passenger and cargo capacity along with unparalleled seat-mile economics in the medium twin-aisle market. Since its launch in June 2013, the 787-10 has won 132 orders from six global customers. Certain statements in this release may be “forward-looking” within the meaning of the Private Securities Litigation Reform Act of 1995. Words such as “expects,” “forecasts,” “projects,” “plans,” “believes,” “estimates,” and similar expressions are used to identify these forward-looking statements. Examples of forward-looking statements include statements relating to our future plans, business prospects, financial condition and operating results, as well as any other statement that does not directly relate to any historical or current fact. Forward-looking statements are based on current assumptions about future events that may not prove to be accurate. These statements are not guarantees and are subject to risks, uncertainties and changes in circumstances that are difficult to predict. Many factors could cause actual events to differ materially from these forward-looking statements, including economic conditions in the United States and globally, general industry conditions as they may impact us or our customers, and other important factors disclosed previously and from time to time in our filings with the Securities and Exchange Commission. Forward-looking statements speak only as of the date they are made and we undertake no obligation to update or revise any such statement, except as required by law. Are Clean Air Zones another step closer to reaching the 2040 air quality plan?